Sweetie Pie Turner, here, MomGoth’s mom’s cat. It’s the first of the month, so MomGoth wants me to tell you to go read the Monthly Hot Flash on the Hot Flashes page. Tipper isn’t in trouble again; I just wanted to touch base with my fans and friends. In fact, Tipper has been exceptionally good. (I hope that doesn’t Jinx him!) MomGoth says he’s been very playful and cuddly, and stops when he’s told “no.” Not very cat-like, but it pleases the humans. My mom and MomGoth have started watching reruns of a show called Frasier — because it has a DOG in it! MomGoth even put a picture of the same kind of dog, a Jack Russel Terrier — on her smartphone as wallpaper! I am highly offended. It could be worse: Mom isn’t thinking about actually getting a dog, especially a terrier! 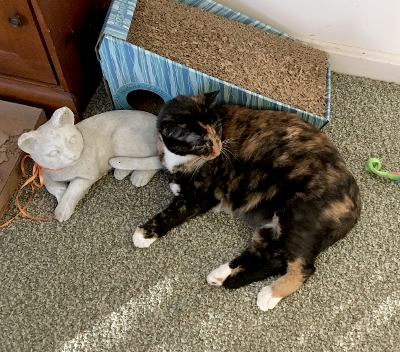 Here’s a picture MomGoth took of me with the statue of my late foster-brother, Ozzie. So Mom’s friend was going away for a week and said, “There’s this kitten I’ve been feeding, and I don’t want to leave him on his own for a week. How about I bring him to you?” MomGoth thought that would be a good way to see if I liked having a playmate, so Mom said yes. After the friend came back, Mom asked her when she wanted to pick up her cat. The friend said, “I gave him to you!” So I had a brother. But the friend doesn’t remember anything about that. MomGoth says, “Your friend sure put one over on you,” and she and Mom laugh and laugh. A WRITING PROMPT FOR CATS: Do you have a playmate? Would you like to have one, or would you like to get rid of one you have? That’s a pretty good way to get rid of a cat. We got our second cat because our first cat needed a “pet” to play with. When our last male cat passed on, we got a pair of kittens. So, whaddayathink…does Tipper need a playmate? Also, I love Frasier. I’ve cycled through that show so many times over the years and it remains one of my faves.